Here comes Halloween with all of the fun and frightening decorations that the kid in us adores. Step aside Christmas and wait your turn! I love turning my house into a black and orange tribute to vintage Halloween style. In other words, minimal blood and gore, but plenty of spooky ambience. I like to change up my decorations each year, but alas, budget constraints can make this a challenge. Luckily, I have BAM! Tape masking tape in my decorating tool kit, so I can add colorful decorations pretty much anywhere that I want. This year, I decided to use the living room mantel to create a Creepy Lab theme. 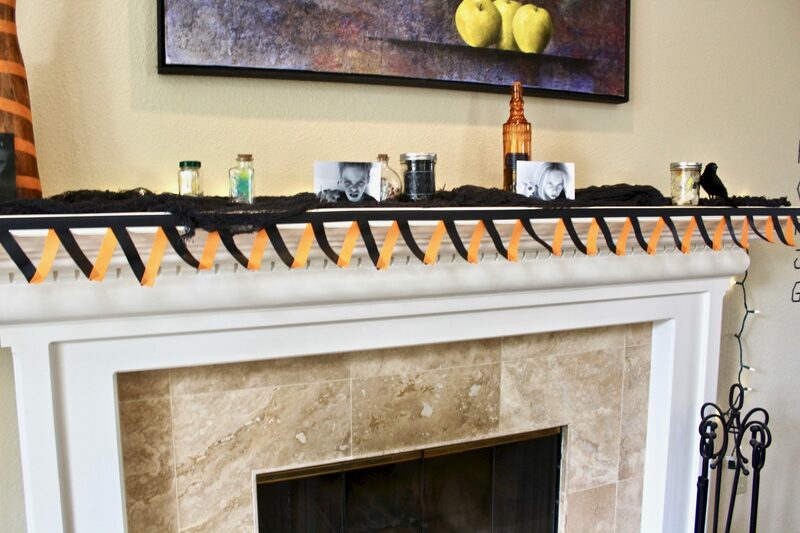 I anchored the theme with orange and black tape on the mantle. First of all, I made a bunting with the masking tape, and then I wrapped a couple of wooden vases. After I had my tape in place, I added some black netting material, a few “specimen” jars and creepy photos of my kids a.k.a. the “lab personnel! I love how the masking tape pulls the whole look together. Next I added some fun BAM! Tape color to my front door. This was such a simple yet rewarding project. Most noteworthy, it literally took me 20 minutes! I followed the existing design of the door to create a contemporary grid and then I taped around the door frame to add dimension. 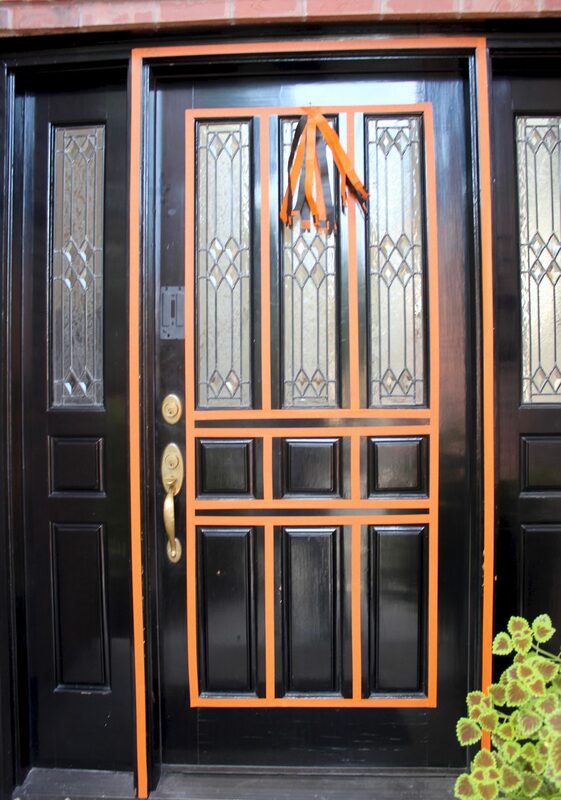 The orange masking tape really pops on my black door. I made a simple decoration for the top by sticking pieces of tape together (sticky sides together) to create ribbons and fastened them together with…yup, masking tape. I’m so predictable! My daughter, Siena was inspired by our front door design and decided to decorate her bedroom door. She created hers on the fly with just her imagination and masking tape. Perhaps you will notice that the little thief stole my front door tape ribbons! Regardless of her criminal activity, I think that she put a darling door together. Makes me smile every time I walk past it. 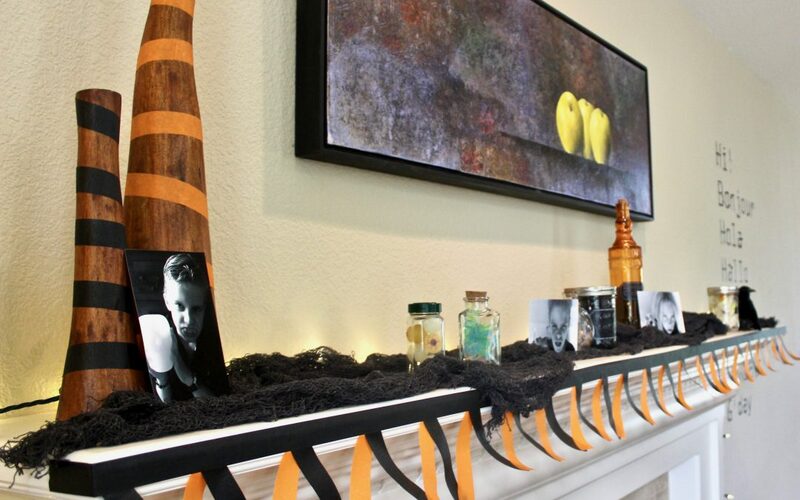 Please use our comments section to tell us about your Halloween projects using masking tape. Happy Haunting and Happy Taping!